Wagner booth at the Energy Europe fair in Copenhagen. Denmark is a world leader in renewable energy policy and technology, and the country’s goal of 100 % conversion to renewable energy gave rise to a new major event: the international Energy Europe exhibition and conference in Copenhagen. But despite being a much-advertised showcase for renewable energy and e-mobility with massive political support that was held for the first time this year, unfortunately lacked behind expectations. “It was weakly attended mainly by Danish visitors, although from all regions of the country.” Wagner & Co sales manager Hardy Braun recalls, although the organizers announced the presence of Denmark’s 25 top energy experts and reported visitors from more than 40 countries. Energy Europe aspires to become a major exchange and meet up event for the European renewable energy industry. 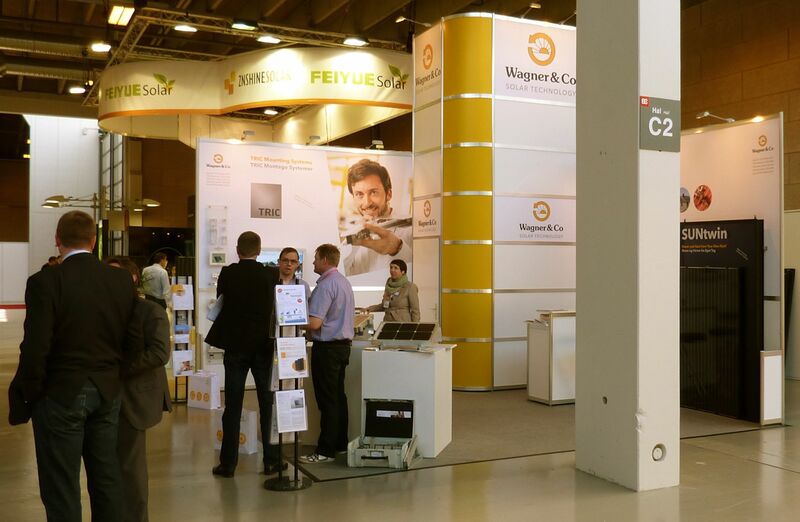 Wagner & Co jointly operated a booth with 3 regional partners, which were the companies Nyrup Energi and Gudmundsson, both from the main Island of Sjaelland, as well as a representative of the German company Solaragentur Nord from the town of Schuby. Solaragentur Nord plans a distribution joint venture for the Jütland area with a Danish partner. Our partner companies had invited customers from their respective distribution regions, and we jointly presented our product range, especially the award winning SUNtwin solar heat and power combination and our TRIC range mounting system. SUNtwin with its elegant full-black LG modules and black EURO L20 collectors turned out to be a good peg to hang conversations with visitors on. Bilddownload 1: Wagner booth at the Energy Europe fair in Copenhagen.